Schilthorn, the Swiss peak in the Bernese Alps, is the perfect combination of spectacular views and a James Bond film-like feeling. A cold wind sweeps around in gusts, slapping around everything even during peak summer in this part of Europe, and the temperature hovers around the low single digits. Thick curtains of mist and clouds shroud the sun, letting little beams through only occasionally. But when the clouds clear, the views are spectacular. Standing on the summit of Mount Schilthorn high above the scenic Lauterbrunnen Valley in the Bernese Alps of central Switzerland, the views of Jungfrau, Monch and Eiger are jaw-dropping to say the least. 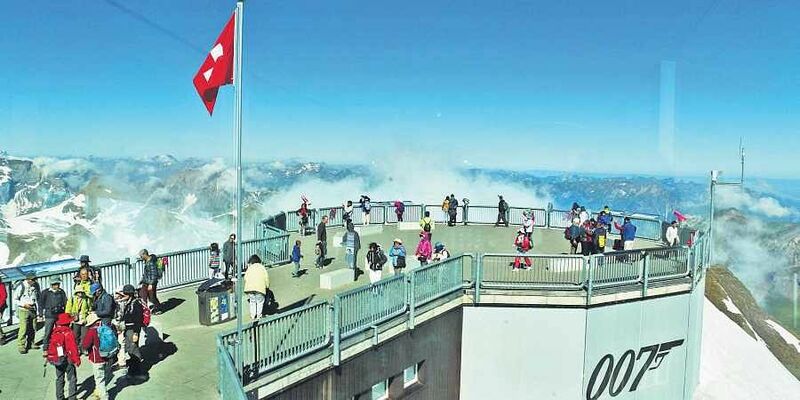 However, Schilthorn has something even more enticing—a Bond connection. At nearly 3,000 m, Mount Schilthorn is among the tallest peaks in Switzerland and is accessed through a cableway from Murren village. But more than everything else, it is popular for Piz Gloria, a revolving restaurant that sits on the summit and was the lair of Bond villain Blofeld in the iconic 1969 movie On Her Majesty’s Secret Service starring George Lazenby as 007. It is here that Blofeld ran an allergy clinic in which Bond managed to infiltrate, resorted to his usual shenanigans and then skied down Schilthorn’s slopes to safety. The restaurant itself aims to provide a unique experience with a Bond brunch featuring prosecco and delicious food, and beautiful panoramic views for company. The name originated from the movie itself and continued to endure nearly half a century after the film was released. It is amazing to sit down to the elaborate buffet-style brunch and watch scenes from the original movie on clapboard style TV screens scattered all over the restaurant. Outside, the Bond theme continues. A wraparound terrace around the restaurant offers various experiences from the film, both endearing and cheesy. Especially popular are the life-size cut outs of Lazenby in trademark Bond pose gun aimed into the distance and a metallic cylinder with curving lines, which provide the perfect frame for a photograph. There are several spy-style telescopes through which one could get a better view of the peaks around and valleys below. But more thrilling is the newer 007 Walk of Fame. Exposed to the elements, a winding path snakes its way to the absolute edge of the summit. Though the path is flanked by carpets of snow, what make the path interesting and engaging are the vertical weathered steel plaques, each with a photograph, information, titbits and trivia about some of the main protagonists of the film along with signature and hand print. Once you reach the circular metal platform, it feels like being on top of the world, surrounded by Bond. Offering more from Bond’s life is the Bond World 007. Located under Piz Gloria, this interactive museum was designed predominantly around the making of On Her Majesty’s Secret Service, but there is much more to it. A funky passage with psychedelic lights, Bond-style music set the mood for the visit. From inside, it looks like a Bond movie set. Among the attractions is a helicopter, a little studio where one can make their own Bond-style picture choosing from several characters. Even after heading back down to Murren, the surreal Bond effect stays in your head for days and months.